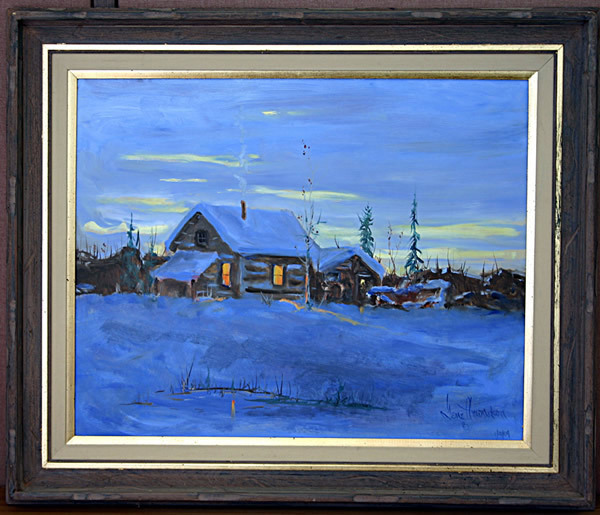 This oil painting comes from houses at my end of Eastern Lewis County, near Mount Rainier. I lived 7 mies up the creek from Morton in a logging camp called Kosmos. When I was 16 my dad talked to old Mr. Morris and helped me buy the 1930 model "A" for $175.00 that I still have. Men were loggers. That means booze, excitement and all that goes with it. Logging was first to shut down in the summer and last to open in winter. So our people knew hard times. We had a sled that held 32 people made at the logging camp, by our dads, who were out of work. So no matter how poor the people or high the snow, we loved winter.